A large and energetic crowd surrounded the stage during today’s weigh-in for the Saunders Lemieux card at Place Bell, in Laval, Quebec. Kicking off the action on HBO tomorrow night at 9:40 PM/ET will be rising star and undefeated Long Island knockout artists, Cletus “The Hebrew Hammer” Seldin (21-0 17KOs) as he steps in against Canadian, Yves Ulysse Jr (14-1 9KOs). 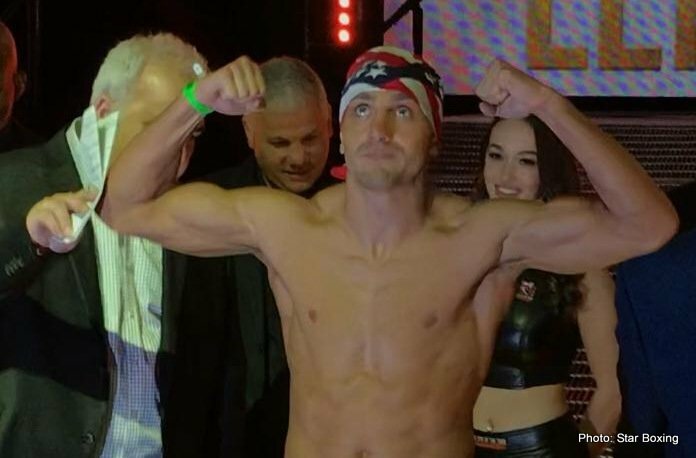 The two men tipped the scales at Place Bell, as Ulysse came in at a fit 141.2 lbs, and Cletus “The Hebrew Hammer” Seldin came in at a ready 141.6 lbs. The bout is a scheduled 10-round jr. welterweight showdown, as both men look to leave their mark in front of a national audience. Boxing’s newest star, undefeated junior welterweight CLETUS “The Hebrew Hammer” SELDIN, (21-0, 17 KO’s) of Long Island, New York and YVES ULYSSE JR. (14-1, 9 KO’s) met the media for the final time today just two days ahead of their 10-round showdown this Saturday night, December 16 at the Place Bell in Laval, Quebec, Canada and live on HBO World Championship Boxing beginning at 9:40 p.m. ET. “Friday after the Ortiz knockout I got the call to fight Ulysse on December 16 and said yes immediately. This is my job, I’m a prizefighter and I love to fight and entertain,” said Seldin who had a huge crowd of passionate supporters at Nassau Coliseum known locally as the ‘Hamma Heads’. Boxing’s newest star, undefeated junior welterweight CLETUS “The Hebrew Hammer” SELDIN, (21-0, 17 KO’s) of Long Island, New York arrived in Laval, Quebec, Canada today with his promoter, JOE DEGUARDIA, President and CEO of Star Boxing and trainer PETE BRODSKY, days ahead of his showdown this Saturday night, December 16 against YVES ULYSSE JR., (14-1, 9 KO’s) in a ten-round junior welterweight battle live on HBO World Championship Boxing from the Place Bell. 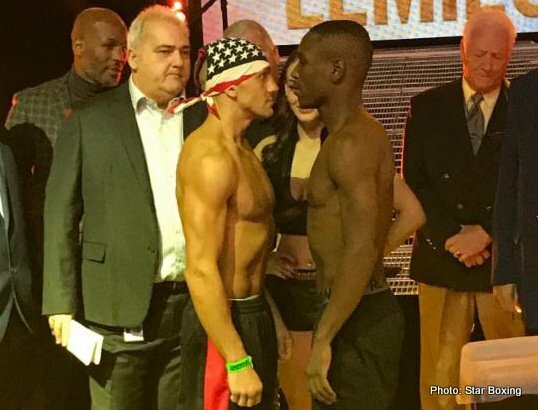 Seldin vs. Ulysse will open the telecast at 9:40 p.m. ET. Seldin will be making an almost unprecedented return to HBO World Championship Boxing in back-to-back months due to his exciting and relentless style. Previously only boxing legends Mike Tyson in 1986 and Roy Jones Jr. in 1996 appeared on HBO in consecutive months. Saunders vs. Lemieux, a 12-round fight for the Saunders’ WBO World Middleweight Championship, is presented by Golden Boy Promotions and Eye of the Tiger Management in association with Frank Warren. Douglas vs. O’Sullivan is a 10-round fight for the WBO Intercontinental Middleweight Title presented by Golden Boy Promotions and Eye of The Tiger Management in association with GH3 Promotions and Murphy’s Boxing. Seldin Vs. Ulysse Jr. is a 10-round fight presented by Golden Boy Promotions, Eye of The Tiger Management and Joe DeGuardia’s Star Boxing. The event is sponsored by Coors Light. The event will take place Saturday, December 16 at Place Bell in Laval, Quebec, Canada and will be televised live on HBO World Championship Boxing beginning at 9:40 p.m. ET/PT.